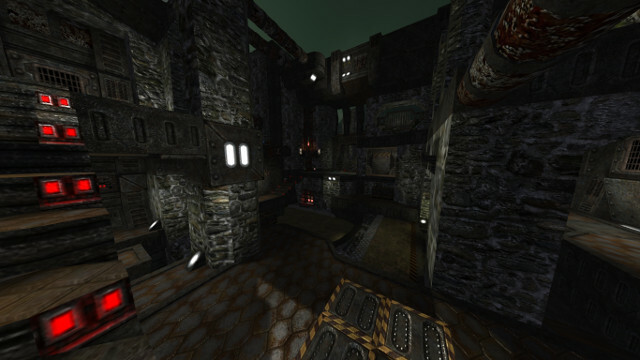 The map has some industrial feeling, yet tries to be natural. That's a pretty challenging choice actually. The rock floor on the bottom of the map could be more natural by being not so flat. Add some geometry in it. The use of the fire particles as a teleport feels plain wrong. Most maps use it as a light-source and add death-material around it. Try to use something else. It misses some lighting-techniques. Working more with primary lights (which light the actual light-source - often a bright but small light-entity) and secondary lights (which light the environment that should be lighted - often a weaker but way bigger light-entity) would fix this.